Will the RidgeRyder TravelKool 22Litre Cooler Warmer prove to be any good? I was really impressed with the overall performance of this inexpensive Ride Ryder product from SuperCheap Auto. The 22litre compartment is ample enough to hold 30 375ml cans, and you can stand normal 1.25litre bottles upright easily. If you have the need to carry 2litre bottles, these will fit laying down. There are two external power sockets one for the 240 volt mains, and a 12 volt one. Two power leads are also supplied, one for each socket. Another thing I liked was the addition of a 2amp USB charging port, so you can charge your mobile devices on the move. The cooling is remarkably good, with the internal temperature dropping around 20 degrees from the ambient room temperature of 24 degrees, to 5 degrees internal compartment temperature, which is 3 degrees cooler than my main household fridge (runs at 8 degrees). The most amazing thing was just how cold the inside compartment managed to get in only a few hours time from plugging into the power source. Don't forget this is a Thermo Cooler, and not a refrigerated product, so that makes its performance even more impressive. It only costs a fraction of the price of a refrigerated unit, and not that much more than a non-powered quality Ice Box. Using the warming feature of the RidgeRyder TravelKool. The internal area heated to around the 55-60 degree mark very fast, so carrying a pre-cooked meal to your picnic area will not present a problem, as long as you have the Ride Ryder TravelKool connected to your 12volt car battery plug outlet. This RidgeRyder product works extremely well, and proves to be great value for your money. Its looks very nicely made and plugs direct into a 12 volt car power socket, or 240 volt mains supply. 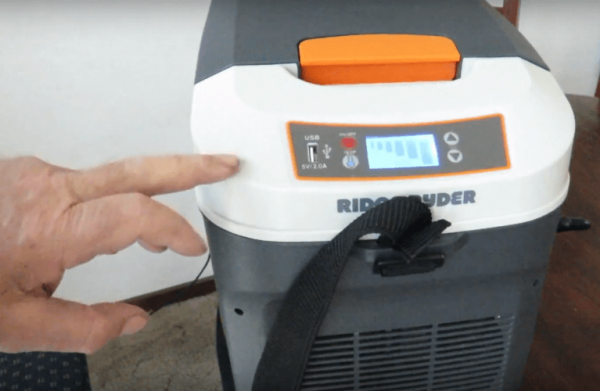 The RideRyder TravelKool 22Litre Cooler Warmer was selling on special at $214 from Supercheap Auto at the time of this review.